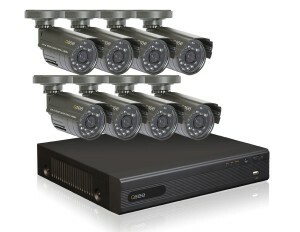 The Q-See QT228-8B5-5 DVR security surveillance DVR system comes complete with 8 full-color cameras that are wired directly to the DVR system. Each camera uses an enhanced ¼ inch CMOS sensor to capture quality full-motion video. The cameras are also equipped with a powerful night vision system comprised of 24 infrared LEDs that can capture full-motion video in zero to low light at up to 50 feet away. The night vision system will automatically turn on according to surrounding light levels. When the camera is in night vision mode, the infrared LEDs will emit a dim red light. The cameras connect to the DVR with a 60 foot cable which transmits power to the camera and sends video back to the DVR. The yellow BNC connectors are for video and connect directly into the back of DVR unit. The Red RCA connectors are for power and they connect between the camera and a 4-way power splitter cable that’s plugged into a power supply. There are two power supplies with each one powering 4 cameras. If the included cables aren’t long enough, longer cables can be purchased. Q-See recommends also connecting a separate power supply to any cable longer than 60 feet. Longer cables of up to 1,500 feet can be used but different types of cables are needed once the cable is greater than 180 feet. Consult the Q-See website for more information about the kinds of cables that are needed and when they should be used. Each camera can be mounted on a wall, ceiling, or any flat surface. Q-See includes 8 pre-made, tri-axis mounting brackets to allow for secure mounting and exact positioning of each camera. Also each bracket hides the video/power cable inside to prevent cables from being cut or disconnected. The cameras are weatherproof but not waterproof. What’s the difference? Weatherproof means the camera is safe for the usual splashing and blowing of rain and snow. However, the camera is not rated for submersion in water. If the camera would be submerged for any length of time it would most likely be ruined. One last note about the included cameras – they don’t have a built-in microphone. So they cannot transmit sound back to the DVR. Plus there is no light on them to show when they are active. Unlike some other Q-See DVRs, this model comes with a 500 GB hard drive pre-installed. To add additional storage, the hard drive can easily be upgraded or another hard drive can be added. The QT228-5 DVR supports SATA hard drives up to 2 TB. Video is recorded in H.264 format which can be easily reconverted into other formats if needed – more on that later. One of the most common questions asked, is “how much can the DVR record?” This isn’t a simple answer. There are several factors that must be considered first. When setting up the DVR, the video resolution and video quality must be chosen. There are 3 resolution settings and 3 quality settings. The most popular setting supported by all DVRs is called CIF. This standard records video at a resolution of 352 x 240 pixels at 30 fps (frames per second). The CIF format helps cut down on hard drive space consumed by making the video resolution smaller so more frames per second can be recorded. The 30 frames per second rate produces smooth motion pictures just like your TV set. Another setting is called D1. This setting records video with a resolution of 720 x 480 pixels at 7.5 fps. This type of recording is very jerky. Fast actions can sometimes be missed in these types of low fps recordings. The video is bigger so details are more easily seen but the frame rate is low. This also is used as a hard drive space saving method. The last setting is called 4CIF or D1(30 FPS). Like D1(7.5 FPS), the resolution is 720 x 480 pixels but the frame rate is 30 fps. This setting by far uses the most hard drive space but produces a much better video with smooth motion. The DVR also has video quality settings of best, good, and normal. The best setting produces a crisper video while the normal setting is little less sharp. For most applications, normal may be good enough. The normal setting uses about half as much as hard drive space as does the best quality setting for any given resolution. Two final factors are the number of hours the recorder will be running and the number of cameras that will be recorded. Obviously if the DVR records all 8 cameras for a 24 hour period every day then much more hard drive space will be used. As an example, if all 8 cameras are recorded for 24 hours at a resolution of CIF and best video quality, the DVR will be able to record for 8 days before overwriting older video files. Changing the quality to normal will double the recording time to 16.5 days. Another example, if D1 (7.5 FPS) is used with Best video quality to record all 8 cameras for 24 hours, the DVR could record for 7.5 days. If the video quality were changed to normal. The number of days would double to 15.5 days. Of course if less cameras are recorded or the number of hours the video is recorded is reduced, then less hard drive space would be used. Video that is not be recorded does not consume much hard drive space. The DVR may use some hard drive space temporarily while the live video feeds are being monitored. But no significant amounts of space will be consumer. To find out more about how long the DVR QT228-5 can record, browse the Q-See Hard Drive Usage chart. Once the video has been recorded, it needs a way to be displayed. The QT228-5 has three video out ports on the back of the unit. One method of video connection is through the HDMI port. The other is through a VGA port. And last is a BNC video out. The HDMI port is the same HD TV input seen on most digital TV sets and the VGA port is the standard Windows PC video connection. The BNC video out is composite video with a BNC connector, like the included cameras. A separate BNC to composite convertor can be purchased if needed. Use any port to connect the DVR to a TV or computer monitor. While the DVR has an HDMI video output, video is not output in HD format. The Q-See QT228-5 records in standard 480 TV lines or 480 TVL as it’s called. Also on the back panel, is the RJ-45 Ethernet port for connecting to your home/local network. A network connection is only needed if the DVR will be used to monitor cameras or watch recorded videos from another location. In order to watch video from another location, a broadband connection is needed. The DVR will be receiving a very small amount of data compared to what it will be sending out. Most broadband providers only monitor the data you receive and not the data you send. So if you are bound by a data cap, you shouldn’t have anything to worry about. The QT228-5 DVR does not support wireless networking. Wireless networking is not a good choice for streaming video since wireless is slow compared to a wired network connection. 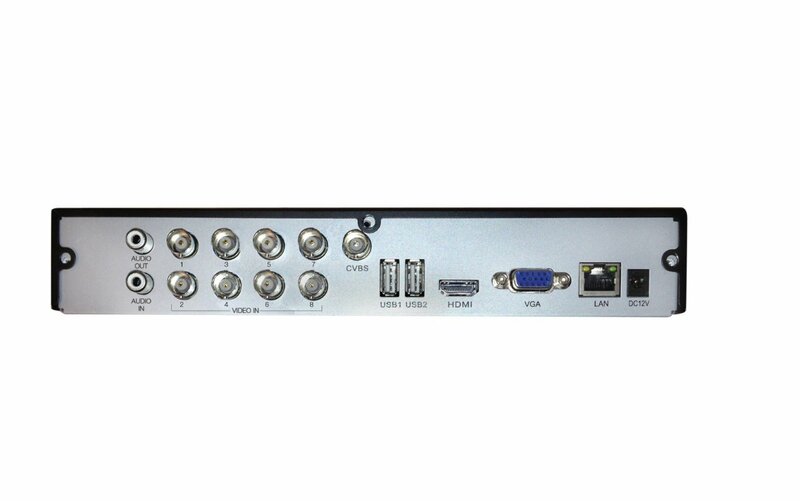 In order to control the QT225-5 DVR, Q-See has built in 2 USB 2.0 ports. One port is for connecting the included USB mouse. The mouse is used during setup and during normal operation. The other USB port is used for file backup and transfers. The QT228-5 DVR also comes with a remote control. Once the QT228-5 DVR is connected to a network, it can stream live video to a PC, Mac, Smartphone, or tablet. 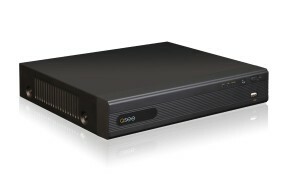 This Q-See DVR uses the UpnP (universal play and play) standard to connect to the local network. Any router that supports UpnP will instantly add this machine to the local network granting any other machine on the network access. To view streamed video from outside the house, the router will have be configured properly in order to allow outside access to the DVR. The Q-See website and user manual have plenty of details on how to set this up. Once the router is configured, video can be streamed outside the home or business for live monitoring of the cameras or to view previously recorded content. Streamed video can be viewed on a Mac, PC, iPad, iPhone, Android smartphone, Windows phone, Android tablet, or Windows tablets. In other words, virtually any device that can view video can view streamed video from this DVR surveillance system. The Q-See QT228-8B5-5 Security Surveillance DVR System is full of features that will make it suitable for any novice or pro to use. Before the QT228-5 DVR can be used for surveillance, it must be configured. The setup process is very simple to get a basic usable machine up and running very quickly. It all starts with a simple right-click of the mouse. Then selecting Main Menu, followed by System, will allow the machines functions to be viewed and modified as needed. This is the place for setting the date and time, creating an access password, choosing the default language, and performing system maintenance. From the time the DVR is powered-up it is functioning as a basic video surveillance system where live video from each camera can be viewed. At this point, recording and video stream cannot take place because these features have been configured yet. But if live monitoring is what you want, the machine is ready to go at this point. Most people will want more though and this system can deliver. First, the DVR can be set to record continuously 24 hours per day. Or a schedule can be entered for when and when not to record. Even better, each camera can have it’s own schedule as well as video resolution and video quality set individually from the other cameras. These features are all selected from the Record sub-menu. Besides continuous and scheduled recording, the DVR and cameras are also capable of using motion activation to turn on and record activity. Motion activation can be selected for specific cameras. And the motion field can be selected too. So if there is a street in front of your house that you don’t want to be monitored for motion, this area can be blacked out and the camera will ignore motion. The DVR can also send out an email notification when a camera has been activated by motion. Once the notification email address has been entered during setup, the DVR will send out an email message complete with a snapshot taken when the activity alarm was triggered. Once video has been recorded, it can easily be searched based on date and time period. Searching video is a very useful feature especially when someone has vandalized your property. This video can later be transferred off to another device to archive or to be given to law enforcement if needed. Access to the DVR can be restricted by setting an administrator password in system settings. Once the password is set, anyone wanting to use the DVR will need to enter the password through the on-screen keyboard using the mouse or the remote control. Remote access can be restricted as well using a separate password. Recorded files can be transferred to other devices through the 2nd USB 2.0 port on the back of the QT228-5 DVR. Devices can include a USB flash drive, USB portable hard drive, or a USB DVD burner. Files are in the H.264 format but can be converted to other formats such as avi, mp4, etc. Conversion must be done after the files are transferred to another device. The DVR itself does not have the ability to convert video files to another format. The storage device used in the transfer must be formatted to FAT32. FAT32 was used long ago on Microsoft Windows machines. As hard drives and flash drives became larger, Microsoft started using the NTFS (NT files system) structure. NTFS became popular on Windows NT and Windows XP machines and has been used ever since. Modern versions of Windows, Mac, and Linux support FAT32 storage devices seamlessly. The storage device must be formatted to the FAT32 format before being used as a backup or storage device. The maintenance menu has a built in backup utility so backups can be made of important video surveillance files. PTZ (pan, tilt, zoom) cameras can be used with this system. However the system lacks the connections to control the motorized functions of the cameras. In other words, if a PTZ camera is used, only the video coming from the camera is used. This is a little good news if you want to use an existing camera which is already mounted. Just connect the new wires or use the old ones if less than 60 feet. The Q-See QT228-8B5-5 Security Surveillance DVR System has received many very good reviews by customers with 86% of them giving the system a 4- or 5-star rating. 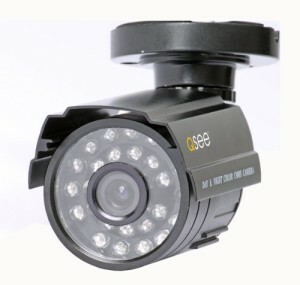 The most common compliment from customers is that the DVR camera system is very easy to install and use. But there are some complaints about the image quality not being good enough with washed out, faded colors. The problem with picture quality can possibly be caused by several factors. Customers fail to remember this is a 480 TVL camera system. As with televisions, 480 lines is not high definition. Although the DVR supports HDMI, this connection is showing images that aren’t HD. So no matter what you use for viewing, the images will always be 480 TVL. Faded color can have something to do with camera placement and the amount of light reaching the camera lens. The same holds true with night vision. Night vision can work for up to 50 feet. But the more ambient light around, the better and further the night vision will work. In this case, low light is more helpful than having no light at all. This is a bundled package which has several benefits over buying individual components. The biggest benefit is overall cost savings. When comparing this system with the cost of the DVR alone, it is easy to see the savings. With an added $70 to $100 to the price, all the cameras, wires, and hardware are included. Plus, there is no need to spend time searching for the additional cameras and hardware needed. If this search would involve going to another store locally, the added cost in gas could be a consideration. 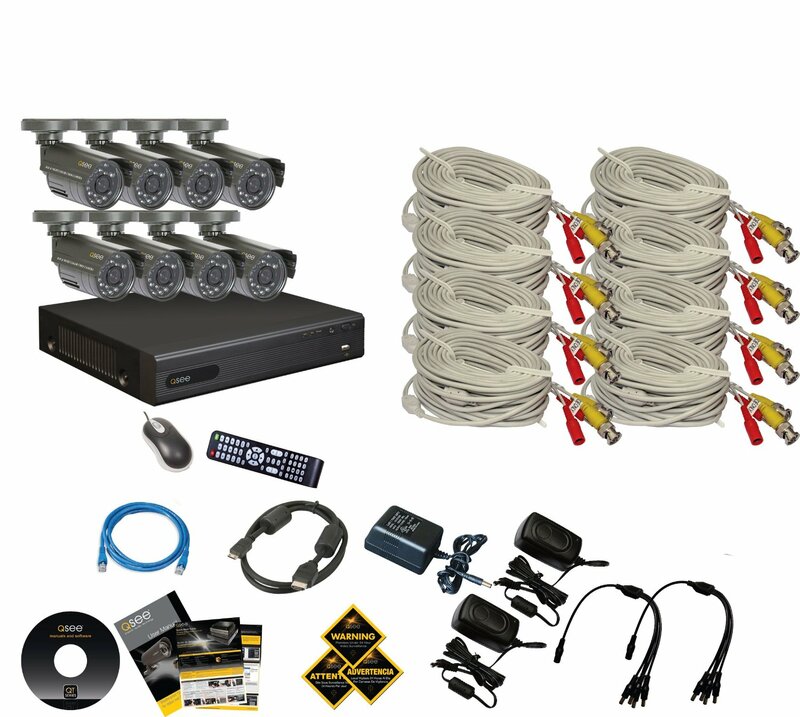 Overall, the Q-See QT228-8B5-5 Security Surveillance DVR System is a very good choice especially for someone who has never installed or used a surveillance system before. The included cameras, wiring, and mounting hardware make it simple enough that a complete novice can install and setup in just a few hours. But the system is powerful enough to allow more advanced users to benefit from the extra features. Using this system, anyone can arm themselves with a relatively inexpensive tool to protect their family, home, and property.